Much like cable, the channels on Rok TV are scheduled programming available 24/7. Some of our channels are happening as you watch, while others are pre-recorded and delivered in a live format. 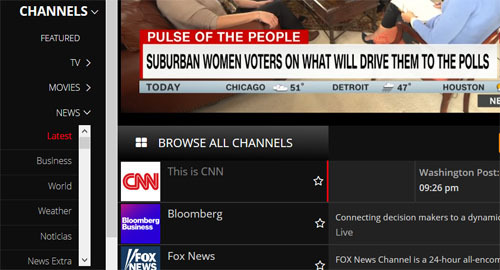 When you select any channel from the side menu and it starts playing, you will see the other live channels available in that particular category just below the video player. You can find channels for a variety of different genres and categories including Featured, TV, Movies, News, Music and more. 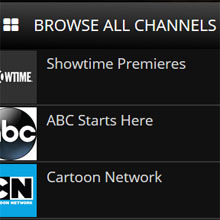 To view a larger version of the full Channels menu, select "Browse All Channels" from the channel guide, just beneath the video player. You can also search for a channel using the search bar at the top of the Browse All Channels window. 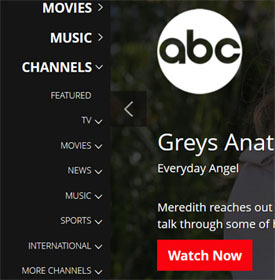 When you select any channel in the SmartGuide, also note the toolbar located directly below the video player. Here you can Favorite the channel you're currently viewing to add it to your Favorites list (or click the star/Favorite icon on any channel displaying in the SmartGuide). You can also select "Theater View" to full screen the video player. To view sports-related channels on Rok TV, select Channels > Then choose Sports. This will present you with categories like Headline Sports, Football, Baseball and more. 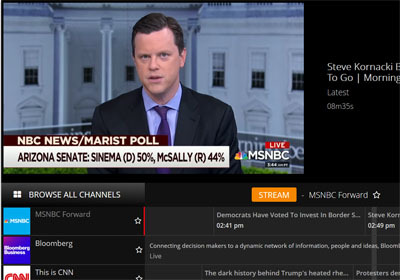 While there is a category specifically labeled "News" under the Channels menu, it's important to know that there are still additional news-related channels and content to be found both in this section, and our on-demand sections.